Questions of money can get tricky and icky. 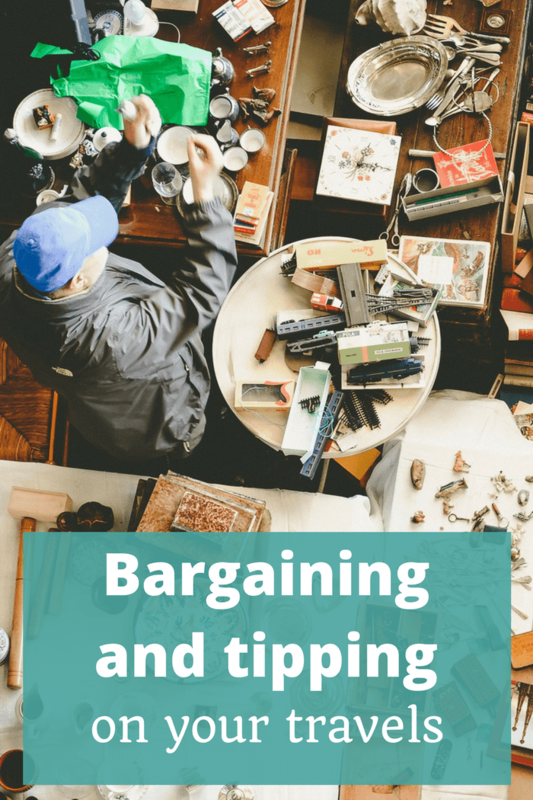 And that’s why I was fascinated to hear everybody’s differing viewpoints on bargaining or haggling when you travel, along with some talk of tipping too (being from Australia, a non-tipping culture, this stresses me no end … well, as does the bargaining bit in other countries too!). Do you love to haggle at the local markets when you travel to get down to the cheapest possible price or are you happier when there’s a fixed price and no bargaining needs to take place? We talk about bargaining (and tipping) on your travels in Episode 91 of The Thoughtful Travel Podcast and it’s a great mix of ideas. First up I chat with Matt and Marilyn from the Words with Winos podcast and they reminisce about some of the bargaining they had to do when they were travelling throughout south-east Asia. Next up, ESL teacher Clare Harris and I discuss some of her experiences with money and the differences in value depending on where you come from, and discover that just like me, Clare would prefer a fixed price sale any time! Finally, I chat with Luke Mackin of Wild Sumatra who, after living for some years in rural Indonesia, has a particularly unique perspective. I really liked what Luke had to say and it’s definitely reinforced my opinion that learning to bargain better is not on my list of things to do.